Rima Taher, an expert in the design of low-rise buildings for extreme winds and hurricane, hopes her phone will not ring much this hurricane season. It is already been busy with requests for information about best building design and construction practices to reduce wind pressures on building surfaces. In the aftermath of the January earthquake in Haiti, Taher, a civil and structural engineer at the New Jersey’s Science and Technology University (NJIT) College of Architecture and Design, prepared a document for Architecture for Humanity about best building practices for hurricane and earthquake-prone areas. It is posted on the organization’s Haiti Reconstruction Web site and still circulates in Haiti. In 2007 Taher’s article about the design of low-rise buildings for extreme wind events appeared in the Journal of Architectural Engineering of the American Society of Civil Engineers. Another article on improved building practices for hurricanes appeared in Caribbean Construction Magazine in July of 2009. “Certain home shapes and roof types can make a big difference,” is a common refrain in all her work. Her recommendations include the following. Design buildings with square, hexagonal or even octagonal floor plans with roofs of multiple slopes such as a four-sloped hip roof. These roofs perform better under wind forces than the gable roofs with two slopes. Gable roofs are common only because they are cheaper to build. Research and testing demonstrate that a 30-degree roof slope will have the best results. Wind forces on a roof tend to uplift it. “This explains why roofs blow off during extreme wind events,” Taher said. To combat uplift, she advises connecting roofs to walls strongly with nails, not staples. Stapled roofs were banned in Florida after Hurricane Andrew. The use of hurricane clips is recommended. The choice of roofing is important. 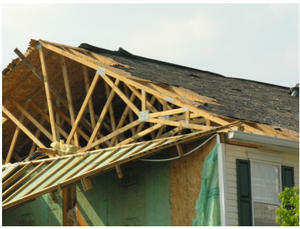 Different roofing systems perform differently under hurricane conditions. In tile roofs, loose tiles often become wind-borne debris threatening other structures. Aim for strong connections between the structure and foundation. Structural failure — one structural element triggering the collapse of another — can be progressive. Hurricane shutters can protect glazing from wind-borne debris. Various designs are available. Roof overhangs are subject to wind uplift forces which could trigger a roof failure. In the design of the hurricane-resistant home, the length of these overhangs should be limited to about twenty inches. The design of the researched cyclonic home includes simple systems to reduce the local wind stresses at the roof’s lower edges such as a notched frieze or a horizontal grid. Install the latter at the level of the gutters along the homes’ perimeter. An elevated structure on an open foundation reduces the risk of damage from flooding and storm-driven water. All foundation piles must be strengthened by bracing and should penetrate deep enough into the soil to reduce the risk of scour.